MIDI master for guitar rigs. Take total command and control of your sound like never before. 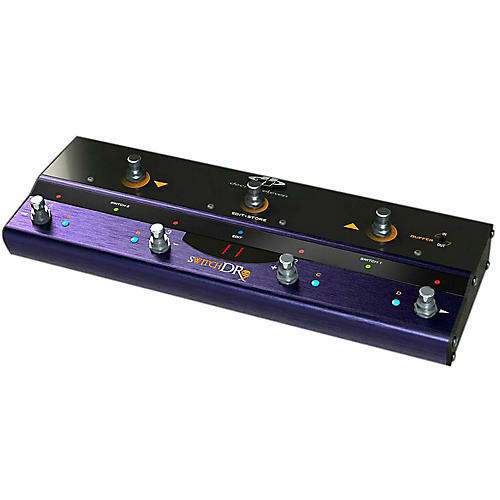 The new Decibel Eleven Switch Dr. (originally introduced as Switch Witch) is a versatile and simple to program master controller that combines fully programmable MIDI control, true-bypass audio effects loops, and amp channel switching capabilities. The compact yet powerful Switch Dr. design is easy to use and meets all of your most basic needs - from sending a single program change to controlling an entire rig. Up to 4 true bypass pedal effects loops. Up to 3 switch control functions for amp channel switching. Optional analog discrete Class A input buffer - for retaining top end sparkle and preventing pickup loading. Direct mode for instant access to individual switches - activated at anytime allowing direct, instant access to the effect loops and control switching. Optional "global" default preset can be accessed from any bank at any time. Presets can be recalled remotely by MIDI for syncing multiple switchers/controllers. Dimensions (W x D x H) 13.2" x 5" x 1.6"
Order today and get seamless switching for your guitar preamp, effects module and other devices.